This break features a number of events including a tour of the Old City and the Torun marathon. Hotel accommodation right next to the Old City at Hotelik w Centrum. Cost of the Trip is £110.00. We will be providing return coach travel from Swindon to Bristol airport, and then from Bydgoszcz airport to the hotel, 4 nights hotel accommodation with breakfast and a tour of the historic town centre. Click here to see full details and booking form. Can anyone help with picking up the Torun delegation from Bristol Airport on Saturday 10th October, they arrive at 10am. Lift back required Tuesday 13th October at 12.40 if so it would be very much appreciated! 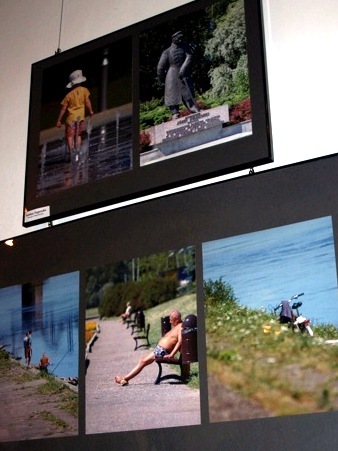 The plan is to host an exhibition of photographs from Torun in Swindon's Central Library. Our application for a twinning grant has been approved by the Swindon Borough Council Twinning Committee with support from Councillor Kevin Small and also Bruce Clarke of the Ocotal link group and Councillor Ray Fisher. We should like to combine the photography exhibition with some Polish poetry by choosing some selected verses or whole poems from the various poems which Anita has translated - both in Polish and English - and matching them up to some of the photos. Please get in touch if you can help us with putting on the exhibition. About planned Swindon participation in the Torun Marathon (including Councillor Stan Pajak). Stan Pajak, Marek Sarnowski and Peter Robinson visited Toruń for a long weekend for Toruń's marathon / half marathon. Stan and Peter were runners. During the weekend the delegation invited Torun runners to come to Swindon to take part in this years Swindon half marathon and following on from that an invitation was sent on behalf of TASTE to Torun. Bowling, golf, field hockey, equestrian, cycling MTB, basketball, track and field, soccer, volleyball, beach volleyball, handball, skate boarding, sport shooting, fencing, ping pong, tennis, family events, fishing, sailing, swimming, badminton, chess, ringo, triathlon. Stan Pajak and Peter Robinson took part in the Torun Half Marathon 2009 at the beginning of June, they also met with officials and visited the new speedway stadium in Torun. Further details in a report from the Evening Advertiser - Councillor hopes to strengthen links with twin town. Plans in progress to prepare an exhibition of photographs from Swindon. Taste Group Summary Document 2008 in Polish published. Prosze tu kliknąć aby otworzyć dokument w którym opisano działalność grupy Taste. This event took place in Toruń between 30th June and 6th July 2008. Swindon together with all of Toruń's other partner cities, were invited to send a delegate. For the same event last year (in 2007) two professional photographers from Swindon represented Swindon in the event. This year a young (19 year old) lady, Sabina Paprocka from Swindon, took part in the project. Sabina was delighted with her experience and as a result intends to pursue her interest in photography further. Her photographs at the exhibition are shown on the left. The Agreement offers new opportunities for cooperation between individuals and organisations of both towns.